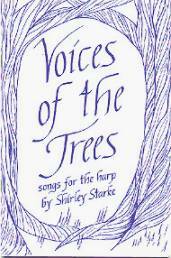 Voices of the Trees: Songs for the Harp is a collection of 21 songs about the trees, hills, water and woods, and at the same time about love, sorrow, and the world beyond this world. This little book has received rave reviews in many publications because of the beauty of the words and melodies. The songs are written as lead sheets which include words, melodies, and chords. They are written for lever harp but can be played on any instrument; Valkyrie Publications also has many of them available as sheet music arranged for the harp. The cover is linen textured card stock in blue and silver grey. 24 pages, 5½” x 8½”. Click to read lyrics and see an illustration. Click to read excerpts from reviews of Voices of the Trees. 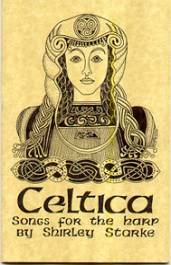 Celtica is a collection of 31 songs about real and legendary heroes of the Irish and Welsh people: Merlin, Owen Glendower, Hugh Roe O’Donnell, W.B. Yeats, Sean Mac Stiofáin, and Bobby Sands, and about the Fairy Host or People of the Sidhe. A few of the songs are in Gaelic. Words, melodies, and chord symbols are included; the songs are written for the lever harp but may be played on any instrument. The cover is heavy gold parchment, with the pages printed on pale gold paper. It is profusely illustrated with intricate Celtic designs by Elly Fithian. 40 pages, 5½” x 8½”. Click to read a review of Celtica and Voices of the Trees. Inspired by The Lord of the Rings by J.R.R. Tolkien, this cycle of 12 songs for harp and voice tells the story of the Battle of the Peak and Gandalf’s return as the White Rider. The ending of each song is a bridge to the next, and the cycle takes about 30 minutes to perform. The songs can also be played individually, and the music can be easily adapted as a harp solo. Level: easy to intermediate. The songs are titled, in order: 1. Where Are the Days? 2. I’ll Sing You A Song. 3. Tell Me, O Wanderer. 4. The Sword That Flashed. 5. Under the Mountains. 6. The Battle. 7. All the World’s Secrets. 8. Bright Are the Leaves. 9. All the World’s Secrets. 10. Tell Me, O Wanderer. 11. 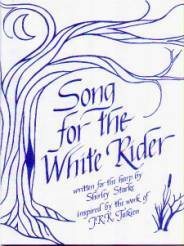 Song for the White Rider. 12. Leaves of Gold. The songs are written in the Dorian, Aeolian, and Phrygian modes (medieval scales), and the levers are set at the beginning so that it can be played in three keys (one sharp through one flat) with a few optional changes but no required ones. Words, melody for voice, arrangement for the harp, and chord symbols are included. The book is 8½” x 11”, 28 pages; the cover is linen textured card stock in dark blue on white. Click to read a review. 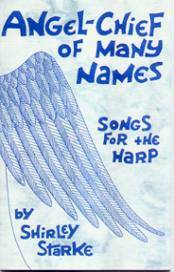 This is a collection of songs about the Heavenly Host and especially about Christ as King of Angels. The songs have a strong mystical bent: they are truly love songs to God. The songs show the influence of C.S. Lewis and George MacDonald as well as St. Teresa of Avila, St. John of the Cross, and Julian of Norwich (“All shall be well, and all shall be well, and all manner of thing shall be well.”). Songs include O Light of the Morning, Maranatha, Mary Magdalene, With Tears of Joy, All Shall Be Well, Hail Holy Queen, and 25 more. The book is 36 pages, 5½” x 8½”, and includes 31 songs in lead sheet style (words, melody, and chords) which are written for the harp but can be played on any instrument. Illustrated by Elly Fithian and Yolanda Burke. The cover is printed in blue on blue and white marbled card stock.